A.IRex Digital Reader B.Sony PRS category have been upgraded to make them strong competitors with netbooks as the de facto classroom device of the future. 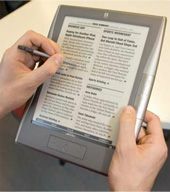 Look for even more readers to be released this year from manufactures including Samsung and Endless Ideas. D Fujitsu’s FLEPia is the only color e-book we’ve seen so far. The device includes Bluetooth, Wi- Fi, a touch screen and 4GB of storage via an SD slot and promises to provide 40 hours of continuous use. Right now the device is available only in Japan.